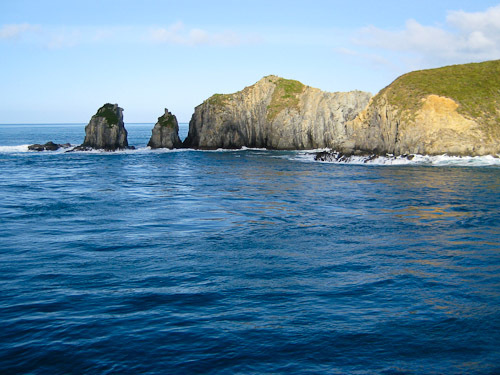 The Catlins Coast stretches from Fortrose, just east of Invercargill, to Kaka Point, just south and west of Balclutha. The first stop for me was Waipapa Point. I photographed the New Zealand Sea-lions that were sleeping on the beach and followed around some Variable Oystercatches and a mob of Ruddy Turnstones which I thought were their brood. 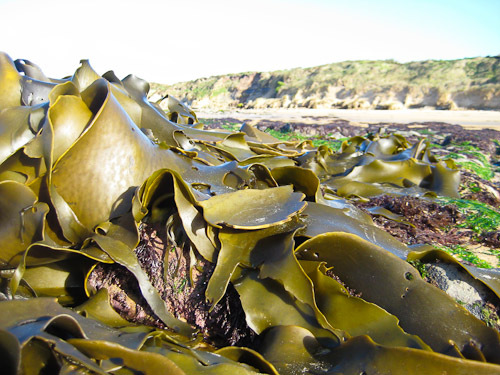 When the tide went out, the reefs were left exposed and there were these massive clumps of kelp left on the beach. In the water the kelp swayed around in big lumps. Curio Bay is home to one of the rarest penguins, the Yellow-eyed Penguin. During September and October, eggs are laid in nests against the bank. From November to January the chicks hatch and remain in the nest. One parent guards the nest while the other fishes all day at sea to feed the chick. I managed to see some more sea-lions as well. 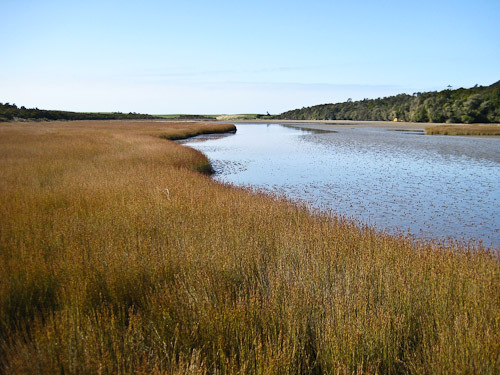 Tautuku Estuary Boardwalk is a twenty minute walk that meanders onto the estuary into fernbird habitat – saltmarsh dominated by jointed rush with sparse shrubs of saltmarsh ribbonwood. The fernbird is a shy red-brown sparrow-sized bird that flies reluctantly. 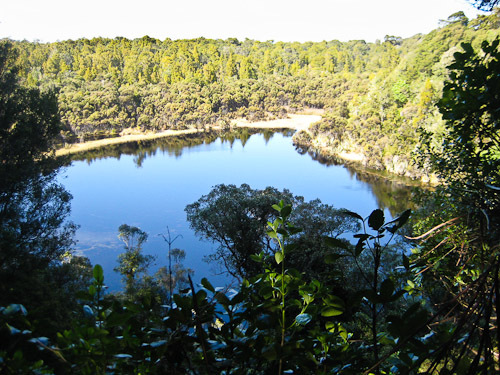 Lake Wilkie formed after the last ice age when water became trapped in a depression between ancient sand dunes and a cliff. It is called a “bog lake”, a rare ecosystem in this region. 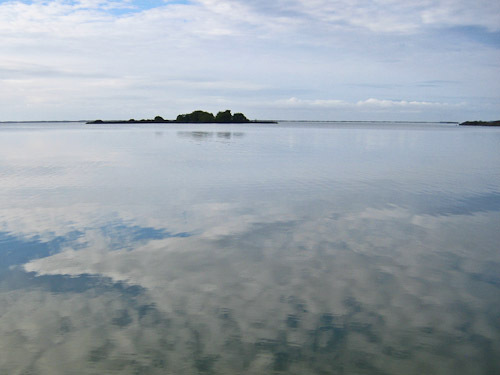 The shallow water is brownish due to organic acids released by peaty soils. Birds commonly seen here include Tui, Silvereye, Brown Creeper, fantail, Bellbird, Grey Warbler and Wood Pigeon. At Papatowai Beach I saw White-fronted Tern (Sterna striata), which are a New Zealand Native bird. Juveniles migrate across the “ditch”, The Tasman Sea, and winter around the south-east Australian coast and the northern coast of Tasmania. They eat fish and small shrimp and hunt in coastal waters or a few kilometers out to sea. White-fronted Terns start breeding at three years and tend to return to the site where they were born, sometimes keeping the same mate for life. 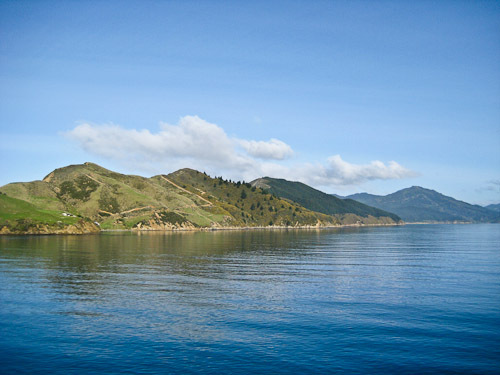 I stayed for a couple of days on the beach at Purakaunui Bay and had a relaxing time. I did manage to film a Yellowhammer (Emberiza citrinella), a common bird found in parks and gardens in open country. The head and throat of the male is yellow with widely spaced brown markings and brown streaked wings. On the estuary at Pounawea I saw a couple of Little Shag. 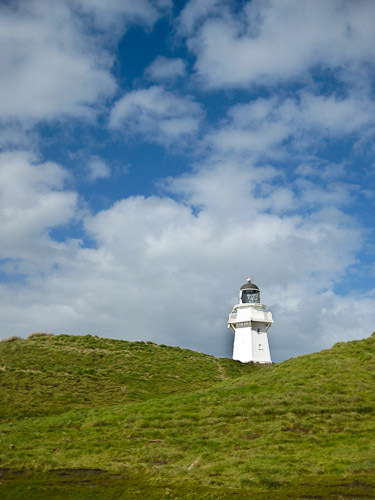 Nugget Point has another lighthouse and there is a hide where you can spot the Yellow-eyed Penguins coming in at dusk. 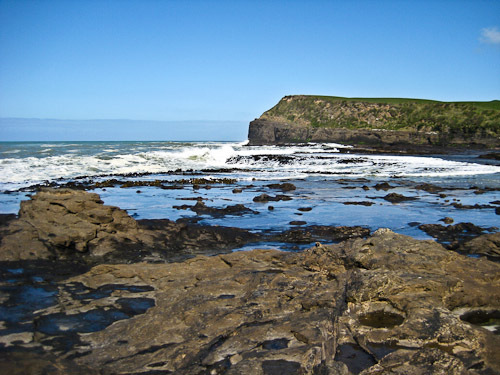 But it is better to see the penguins at Curio Bay. The hide is too far away for a decent look. On the rocks below the cliffs there were some Royal Spoonbills perched on the cliffs. I had never seen that before. They were on the same rock as some nesting Spotted Shags. Spotted Shag (Stictocarbo punctatus) parents guard the nest until the chicks are strong enough to fend off predatory birds. The Spotted Shag hunts far out to sea and in bays, catching fish and plankton. It is an endemic New Zealand bird. 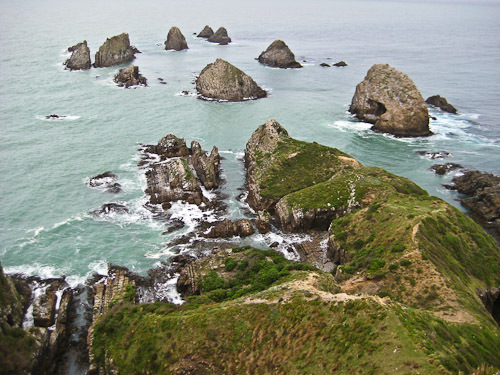 The ones at Nugget Point had nests on cliffs on a small rocky islet just off the point. The weather this morning is cold and blustery. I think the temperature is not going to get above 7 degrees Celsius. There are not many birds about so I have been really disappointed. The estuaries around Invercargill in the South Island of New Zealand are prime habitat for waders, but there is nothing around. What is going on? Maybe they have not arrived from Siberia yet, or they are still up the North Island around the Firth of Thames. 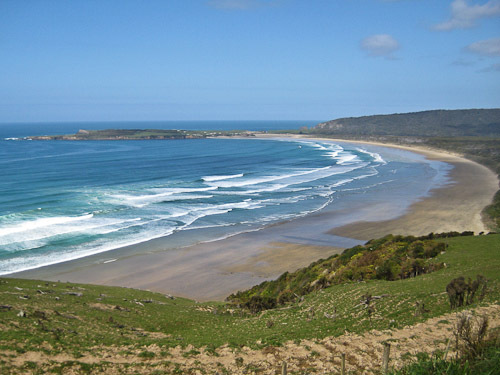 The first stop off was the Sandy Point Domain which is about 7 kilometers west of Invercargill. 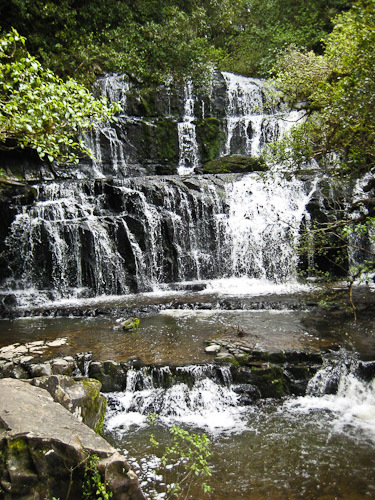 It has a good walking track along the estuary edge with its unusual fringe of totara dune forst. I did happen to see a few Royal Spoonbills and some White-faced Heron. The waders that do come here will eventually feed on an abundant supply of worms and shellfish. After that, I headed to the Bushy Point Fernbird Walk, but did not see any Fernbirds. This is a 600 meter track and boardwalk that goes through mature podocarp forest, shrubland to a coastal wetland meadow of jointed rush and estuarine mud-flats. The estuary is fringed by salt marsh and Jointed Wire Rush dominates the tidal zone which gives way to coastal scrub including cabbage tree, manuka and flax. Birds often seen in the vicinity include Tui, Fernbird, Little Shag and Black Shag. South of here lies remnants of kahikatea, matai and rimu trees, a reminder of the original podocarp forst that once covered much of the area. The Invercargill Estuary Walkway is very close to town on the eastern bank of the New River Estuary. The long walk starts from the historic Stead Street wharf. Recent reclamation has led to the creation of a circular walking and cycling track. Mackenzie and Central Otago Birds. Before I left for the Mackenzie region of New Zealand I filmed a few Canada Geese and New Zealand Scaups in the pond at the camping ground at Ashburton. Then I headed up the hills past Geraldine and stopped at a bridge going over the Opuha River. There was a New Zealand Kingfisher (Halycon sancta vagans) on the wires and a Welcome Swallow and Chaffinch sitting on some rocks in the river. At the Pioneer Park, a few kilometers down the road, I went for a short walk up the hill and saw lots of song birds that I could not identify and a a New Zealand Pigeon. After that, I headed to Fairlie, past the gorgeously coloured Lake Tekapo to Twizel, where I had hoped to visit the Black Stilt hide. Black Stilts are an endemic wading bird with completely black plumage in their adult form and long red legs. They had neared extinction due to destruction of habitat and the introduction of feral predators. But chicks reared in captivity are released into the wild. Now Black Stilts numbers are increasing and extinction has been averted. I did not eventually go to the hide because of car trouble but I did see one fly past at the Ahuriri River. I camped that night on the banks of the Ahuriri River 3 kms north of Omarama. 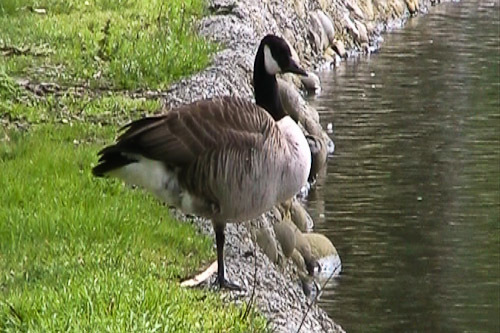 I managed to films some Canada Geese, and saw some terns in the distance fishing in the river. A Pied Oystercatcher was flipping the rocks on the river banks. Just before Cromwell, in Central Otago, I spotted a pair of California Quail (Lophortyx californica) at Bendigo on the banks of the lake formed by the Clyde dam. The male has a distinctive plume on top of his head. I went for a day trip to Queenstown and there were quite a few Mallards who were being quite aggressive at times towards the endemic New Zealand Scaup, of which there were only two. New Zealand Scaup (Aytha novaeseelandiae) are found in mountain lakes and coastal ponds. The male has a bright yellow eye and a dark greenish head. The female is without the yellow eye and has a white face patch during breeding season. There were also some Black-billed Gulls waiting for the tourists to throw them scraps of food and fighting amongst themselves for the tidbits. The Black-billed Gull (Larus bulleri) is usually seen inland and is common on the South Island of New Zealand. Immature birds have pink bills and legs so are difficult to distinguish from the Red-billed Gull. They nest in colonies, mainly on shingle river beds. Birds along the Ashburton River. This morning I went to the Ashburton River just below the bridge that goes over the river at the town of Ashburton in the South Island of New Zealand. On a soccer oval next to the river, I found a few Song Thrush who were hopping around feeding on some worms. There were also some Blackbirds, Greenfinch and House Sparrows around as well. 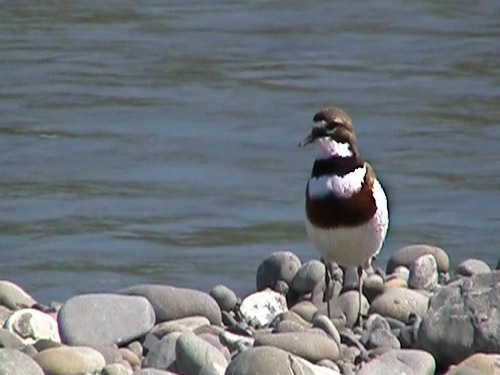 When I went down to the river I saw a pair of Paradise Shelduck feeding amongst the rocks on the river bed. Not far away from them were a pair of Banded Dotterel and later on I saw lots more. I even saw an immature Banded Dotterel and I am sure I saw both male and females. The male has quite a brighter reddish chest band which stands out very strongly. There were a pair of Pied Oystercatchers behaving quite strangely and I got the impression that they were trying to lead me away from their nest but I could not be sure. There were also quite a few Pied Stilt on the river as well as a couple of Masked Lapwing and a solitary White-faced Heron. Song Thrush (Turdus philomelos) is a common species introduced from Europe. This one was pecking around on the oval next to the river. They feed mostly on the ground, where it hops rather than walks. They are of the same family (Turdidae) as the Blackbird. Banded Dotterel (Charadrius bicinctus) is called the Double-banded Plover in Australia (Is it a plover or a dotterel? ), and are endemic to New Zealand, some migrating to Australia. They breed on sandy beaches, shellbanks and riverbeds from July to January. Paradise Shelduck (Tadorna variegata) are a common New Zealand Endemic. The male has a large black head and a dark grey body. The female has a white head and chestnut body. In flight they have prominent white patches on the upperwings. They are usually seen in pairs on pastures, ponds and shallow freshwater lakes throughout New Zealand. The first stop after leaving Christchurch was Lake Ellesmere. It is a convoluted route to get there. I had to go out onto the main highway and dart off into this maze of roads leading through all these low-lying areas. Eventually I found the reserve and camped there for the night. There were a lot of birds in the surrounding pine trees – mainly Blackbirds, Starlings, Chaffinch, Greenfinch and Yellowhammer. After that I went for a walk along the track to the hide at Harts Creek. Black Swan (Cygnus atratus) were introduced from Australia and are quite common. Mute Swan (Cygnus olor) were introduced to New zealand in the 1860’s and there are a small number in Lake Ellesmere. White-faced Heron (Ardea novaehollandiae) colonised from Australia and are now common throughout New Zealand. Mallard (Anas platyrynchos) were introduced from Europe and America as a game bird and are very common. Australasian Crested Grebe or Great Crested Grebe (Podiceps cristatus cristatus) nest from November to January. Just trying to work out if the Australasian Crested Grebe(Podiceps cristatus australis) in New Zealand is a sub species of the Great Crested Grebe of Australia. It seems that there are 3 sub species, European, African and Australasian. Our one and the nz ones are the same sub-species, australis. Australasian Harrier or Swamp Harrier (Circus approximans) are very commonly seen over roads and fields in New Zealand. They are easily identifiable by their white rump. The only other raptor as far as I can tell is the New Zealand Falcon (Falco novaeseelandiae) which is very closely related to the Brown Falcon of Australia. I saw one once in a vineyard in the Awatere Valley in the Marlborough. Pukeko or Purple Swamphen (Porphyrio porphyrio melanotus) are very common both here and in Australia. In all there are about 13 sub-species around the world. Southern Black-backed Gull, Maori Name: Karoro, Scientific Name: Larus dominicanus. Also known as the Kelp Gull – very similar to the Pacific Gull of southern Australia, Lars pacifius, which i thought it was at first. The Kelp Gull has a stripey tail and the Pacific Gull has a red tip on the bill. Grey Warbler – Maori Name: Riroriro, Scientific Name: Gerygone igata. Pied Stilt or Black-winged Stilt (Himantopus himantopus leucocephalus) has a very controversial taxonomy. There are about 5 sub-species around the world with much disputation about the validity of their various statuses. To compound the issue further, the Pied Stilt interbreed with the Black Stilt in New Zealand and create some obfuscating hybrids. Hopefully I will get to see the Black stilt at the hide in Twizel, up in the Mackenzie country. Masked Lapwing (Vanellus miles) colonised from Australia in the 1930’s. New Zealand Fantail , Maori name: Piwakawaka (Rhipidura fuliginosa) is considered by some to be conspecific with the Grey Fantail of Australia, having different calls. The New Zealand Pigeon (Hemiphaga novaeseelandiae) is an endemic New Zealand bird that lives in the forest and feeds on fruits, flowers and leaves. 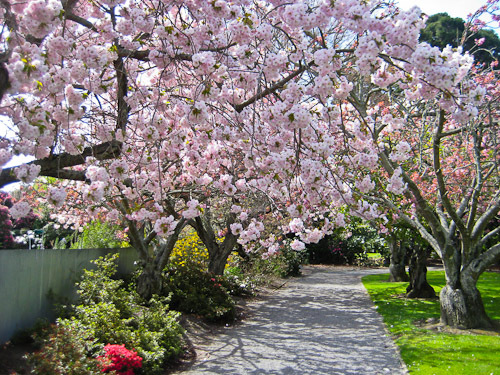 The ones that I saw at Taylor’s Stream near Mount Hutt were eating cherry blossoms. Their nest is a flimsy structure of twigs and sticks supported on several smaller branches. They breed from November to March and generally have one egg with an incubation period for about 30 days. A couple of months ago I went for a trip to Kaikoura. I can’t even remember why I went now it was that long ago. 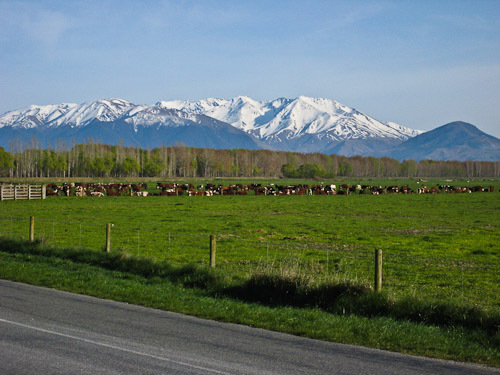 Kaikoura is about 125 kilometers south of Blenheim at the top of the South Island of New Zealand. The town has rebuilt itself as a tourist destination for whale-watching tours. It is a very nice spot indeed with the sweeping panorama of the snow-capped Kaikoura Ranges in the background. About thirty kilometers north of Kaikoura is the Ohau Stream. Every winter Hundreds of New Zealand Fur Seal pups come to the Ohau Point Seal colony. The pups are born in November and December on the rocky seashore and move up the stream. They stay in the stream for a few days each visit but have to return to the seashore to get a feed of their mom’s rich milk. To feed their pups, the mothers spend time at sea hunting for Arrow Squid and Lantern Fish. In earlier years the New Zealand Fur Seal was hunted for food and skins. Hunting them was banned in 1894, but they were nearly wiped out. They are making a comeback but present numbers are estimated to be at only 10-20% of their original population. The Maori name for them is Kekeno. Seeing the baby seals frolicking in the stream is the highlight of my trip to New Zealand so far. I highly recommend stopping and paying them a visit. In Kaikoura itself I went for a wander around the rocky headland and saw some more seals. They just lay around the car park sleeping all day. I saw some oystercatchers, both the Pied Oystercatcher and the Variegated Oystercatcher. Two types of gull – the smaller Red-billed Gull and the large Black-backed Gull, also called the Kelp Gull. There were a number of cormorants, called shags over here. If you do come here make sure you do an Albatross Encounter. You go on a boat ride and see heaps of albatross from what I can gather. Plus lots of other seabirds as well. I have not been yet, but hope to some day. I arrived in New Zealand in early April and proceeded to look for a car. I eventually found a Subaru station wagon that I bought from some Israeli backpackers. I was glad to get out of Auckland and headed south past the Waikato River to Raglan, which is a world famous left-hand surfing spot. 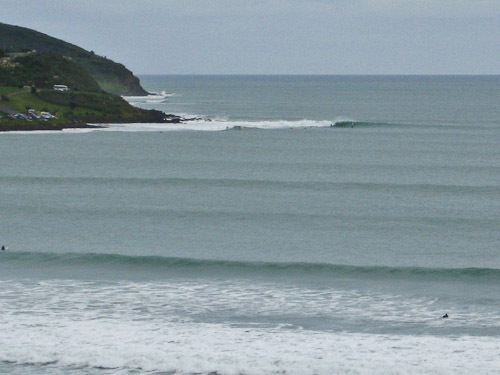 It is a nice little town, typical of most surfing towns. 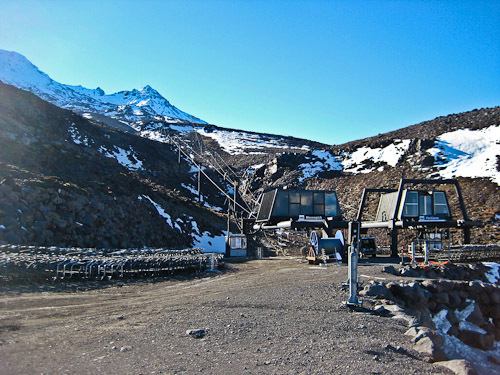 After that I headed through Hamilton and Taumuranui to the Tangariro National Park and Mount Ruapehu where I was interviewed for a job working on the ski lifts. But alas I did not get the job. Here is a photo of one of the chairlifts. There is not much snow yet as it was very early. I had to get a job fast as I was running out of money, so I headed north to Te Puke to look for a job picking kiwifruit. I finally found a job driving a tractor, carting the bins of kiwifruit back to the orchard centre where they got put into a truck. I was not doing enough hours so I applied for a job at the packhouse and eventually found a job working night-shift. It was tough at first working ten hours at night and trying to sleep in the day but eventually I got used to it. And then the season ended. doh! 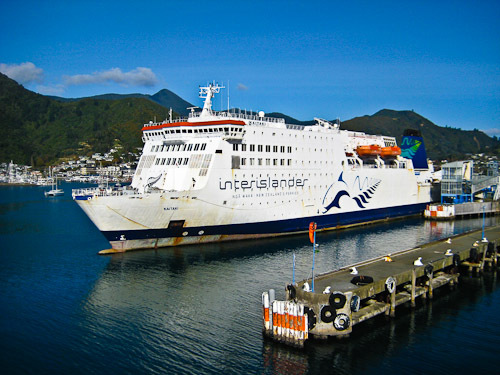 After that I headed south to Wellington to get on a ferry to cross the Cook Strait to the South Island. It is a very spectacular trip, especially as you enter the sound that goes to the harbour. The sounds go for miles and miles and are a very pretty sail. You can see dolphins chasing the other ferry in its wake and the hills around are very green and the water is so clear. Finally we got into Picton and the other ferry was docked at the wharf. I drove from Picton to Blenheim and then south a short way where I worked for three months in vineyards doing wrapping and pruning. This is the part where I plan out my trip to Hokkaido. I may as well lay it all out for you so that you can understand the steps I go through when planning a trip. I have sussed out a flight from Sydney to Osaka via Jetstar. I could have gone with AirAsia and had a holiday in South-east Asia on the way there and back. But I would have skis with me and lugging skis around Indonesia does not seem like a fun idea at all. I may stop on the way back yet, and leave my skis in Japan. Luckily I have been to Osaka a couple of times now so I am fairly confident about getting around. From the aiport in Osaka(Kansai International Airport), I will take the Nankai train line to Shin-Imamiya Station. This will cost about a thousand yen. When you get out of the station turn left and go down the road and you will see heaps of cheap hotels for around 1500-2000 Yen per night. The area is a bit run-down but it has a lot of character and grunge unlike most of Japan which is sparkling clean. I stayed at the Hotel Toyo last time and it was fine. Rooms are about 1500 Yen and you can get a Japanese or western style room. Japanese style is a futon on a tatami mat and I guess Western is a bed. doh! The Hotel Toyo is a couple of blocks down the road right near the Dobutsuenma Subway station, so it is super handy for getting around in Osaka. When you are at the airport, I will drop my skis off at the Yamato counter and they will get delivered to my hostel in Furano. Yamato Express is a courier service which delivers baggage. They are awesome. Just drop them off and your gear will be at your hotel when you arrive. The service is called Takkyubin and is very efficient. They are open from 9am to 6pm at the airport. If you arrive later, then your hotel will fix up the Takkyubin service for you. Get the hotel to book your ferry while you are at it. Now to get to Maizuru. I loaded up the Jorudan train finder website and found that there is a train going from Umeda/Osaka station to Kyoto, then I have to change to the Ayabe train to Higashi-Maizuru. That will take me about three hours so I could take it easy as I would have all day. Make sure you go to Higashi-Maizuru station which is the port and not Mishi-Maizuru which is the town. I could also spend a day in Kyoto if I wanted but I am not in the mood this time. The Shin Nihonkai ferry goes from Maizuru to Otaru in Hokkaido. It leaves at midnight each day and arrives in Otaru the next night at around 9pm. You can get a Second Class berth for 11,700 Yen. So, the next night you will arrive in Otaru at the ferry terminal and you need a place to stay. I will stay at the Otarunai Backpackers. I will probably have to get a taxi there (~550 Yen) but if I did not have skis I could probably walk. As a side note, taxi drivers in Japan are incredibly honest and helpful. They will go out of their way to do their best to get you to where you want to go and will not rip you off. The hostel will cost about 3000Yen per night. From the Otaru bus terminal I will get a bus to Sapporo. They should leave every half hour or so. Then from Sapporo bus terminal I will get the bus to Furano via the Chuo bus. et voila, I will be there, ready to ski for another season. Bring it on!